Jamelao is a multiple World Medalist, 2x Brazilian National Champion, 2x Pan American Medalist, and Jiu-Jitsu legend from the past. 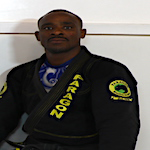 Jamelao is a Black Belt under Jacare Calvalcanti's Alliance Club out of Rio De Janeiro Brazil. Jamelao is famous for his innovation of the deep half guard and his fiery competition spirit.